When the National Energy Board of Canada approved Kinder Morgan’s Trans Mountain Pipeline expansion on May 19, like most people, I was far from surprised. But strangely, I was also somewhat uplifted that day. Buoyant even. Maybe I’m becoming deluded, I don’t know. It’s just that the system did exactly what the system is designed to do: expand the web and capacity of fossil capital, regardless of public opposition, democratic process, infringed indigenous rights, or the science of climate change. Stupid is as stupid does, and I doubt there’s ever been anything in this world quite as dumb as the accumulation of more of everything for the sake of accumulating more of everything. At that moment, it didn’t matter. The NEB, whichever government (Harper’s or Trudeau’s) hell bent on expanding the tar sands—it just didn’t matter. All this feels part of a world that is so patently of the past, redundant now, finished. I’m not saying pipelines won’t get built—they might still. I’m not saying fossil fuels are done like dinner—though they have never looked more vulnerable to system change. I’m just saying something feels different now, and this has an upside and a downside—no doubt a few other sides too. On the UP SIDE, I’m reasonably confident that we are now indeed living in the early days of a transition away from fossil fuels and towards some amalgam of renewable energy sources. I’ve got no hard evidence for this—it’s a gut feeling—but it’s based on what feels like a tipping point in how the media is covering the issues, the sort of weary inevitability that reporters and even industry executives seem to be meeting the constant grass roots resistance and ever-present call for climate action. Maybe I’m in an alternative media bubble, but it seems different now. The Fort McMurray fires are part of this. Floods in Europe. Everything now is openly linked to acknowledged climate change, by both the majority of media outlets and even most government officials. Where climate change would have been ignored or angrily dismissed before, now it seems an inevitable part of our lives—not a ghost of summers to come, but a spectre haunting the hot and dry present. Again, maybe I’m deluded, but the nay-sayers seem to be losing. Ok. DOWNSIDE NUMBER ONE. I think it’s too late. Climate change is already happening and no matter what we do now some amount of destructive warming is here and its effects will be a part of the rest of our lives, our children’s lives, and—if they have children—their children’s lives too. Global temperatures are hitting 1.5 already, sooner than expected, and should shoot past 2 degrees global warming before too long. Oceans will rise, inundating coastal communities. Deserts will expand at the hearts of continents. Food scarcity will be a real issue felt by almost everyone (though the most marginalized and impoverished will of course feel it first), and more and more people will be displaced, the number of those in search of climate refuge swelling into the many millions. Fires, storms, flooding, drought, etc. etc. This even if my rosy prediction is right and we are indeed on the cusp of starting a transition away from our fossil fuel dependence. This even if we, in a few short decades (best case scenario—it really will take time), stop investing in new fossil fuel infrastructure and instead invest public funds in renewable energy, phase out the tar sands, replace fossil fuel driven cars with electric ones and light rail in our cities, etc. etc. UPSIDE NUMBER TWO. As we struggle to deal with the effects of climate change—with food scarcity, mass displacement, extreme weather damage and avoidance of climate impacts (which may involve large scale migrations), the capitalist system will continue to show itself ill-equipped to deal with these challenges. Thus there is still—even if capital does what capital does, and rebuilds itself once again in its own image, only as “green capital” this time—there is still a real opportunity, even a demand, to toss private property, the profit motive, the wage and all the rest to the curb as we come together to deal collectively with the crisis capitalism has created. In other words, we are in the midst of being thrown from the frying pan into the fire; now, what mid-air acrobatics are we yet capable of? Who would rather some other landing place than the flames beneath the pan? I’m sitting right now with an old book open in my lap. It is William Morris’s 1890 utopian novel News from Nowhere. In the future, after long social struggle and a revolution, our narrator is taken through a radically transformed London. Trafalgar Square has lost its imperial column and is now an orchard, as the city has gone through a sort of re-wilding known as “The Clearing of the Misery” (commemorated every May Day “in those easterly communes of London”)—a process which amounts to an erasure of the distinction between the urban and the rural, the town and the country—as in the absence of a “World-Market,” communities have had to learn how to be as locally self-sufficient, and thus as ecologically self-sustaining, as possible. In short, Morris offers an image of entwined and interdependent social and ecological transformation. Trafalgar Square, we learn, was where the struggle really began—with a direct confrontation between the state and protestors. And now Trafalgar Square blooms with an orchard—rather than “beastly monuments of fools and knaves”—revealing its carefully managed provisioning of the local commune. While the NEB does what the NEB is designed to do, and while the Trudeau government goes on doing what industry tells it to do, I find myself dreaming about those sites of struggle—the Burnaby Mountains, Westridge Marine Terminals, Burrard Inlets and tar sands—that may be the sites of future orchards—after the Clearing of the Misery that is fossil capital. This entry was posted in Uncategorized and tagged climate change, fossil capital, Kinder Morgan on June 3, 2016 by Stephen. 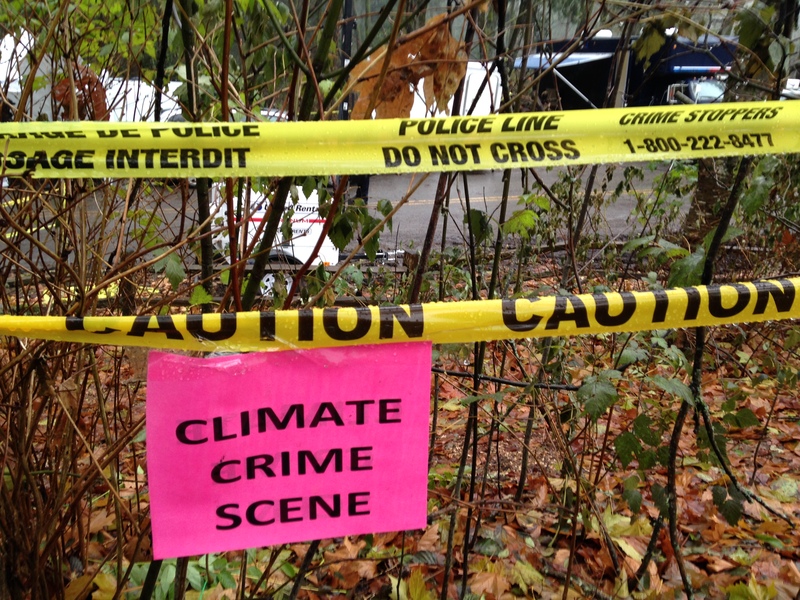 Since we learned, a few weeks ago, that Texas-based oil behemoth Kinder Morgan had entered the conservation area on Burnaby Mountain (in the middle of which sits the public university where I have taught for 15 years), a group of us have been keeping watch for the company’s re-appearance. I think of us as “citizen rangers.” We have chased them off more than once already. And if they return, we will make their attempts to work on the mountain…difficult, to say the least. We hike downslope in the park, from a field where much of Vancouver and its harbour can be seen. Or we ascend from the base of the mountain. The trail is narrow, steep, muddy. 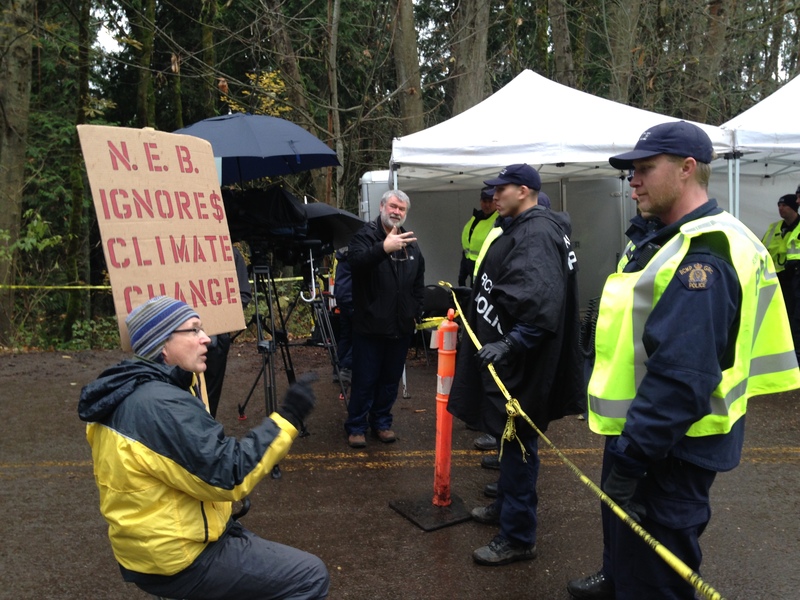 We settle ourselves in the forest clearing Kinder Morgan made—illegally—there with our bodies to prevent their helicopters from landing equipment in the forest conservation area. This is their plan: drill and conduct seismic testing. Then re-submit their proposal to the National Energy Board of Canada. Our bodies sitting in the forest tell a different story. This is grassroots resistance at its grassy and rootiest. The thing about massive energy projects—the devastation they can wreak on local ecosystems, and the global atmosphere as well—is that they have to pass through very small and localizable spaces. We are small. But a pipeline is narrow. The forest clearing just large enough to set down equipment. Or just small enough for a handful of volunteers to occupy. Meanwhile, the struggle continues on other levels too. Community groups like BROKE (Burnaby Residents against Kinder Morgan Expansion) are organized, vocal, active. The City of Burnaby continues to pursue legal means of preventing Kinder Morgan from expropriating city parkland. Burnaby NDP MP Kennedy Stewart continues to pursue parliamentary means of opposition. And the Tsleil-Waututh First Nation, stewards of these unceded lands, are also making their own constitutional challenge. Kinder Morgan, with all its wealth and power, of course has the federal government in its back pocket. The National Energy Board, far from an objective arbiter, has provided Kinder Morgan with over $130 million of Canadian tax payer’s money to pursue its application. And so—sitting on unceded land, in the middle of an urban park and conservation area (where we have on several occasions seen two black bears, amongst many other creatures), and under threat of a massively wealthy private (foreign owned) corporation flush with public Canadian funds—questions about the nature of publicness and the commons almost always come to my mind. Fossil fuel production threatens the global commons—that shared material fact (I don’t like to say “resource”) of what all living beings depend upon: breathable air, drinkable water, a life-sustaining climate, a sustainable food supply. These things cannot be “owned,” and yet the activities of private corporations directly dispossess us of them, prevent access to them, and destroy them—for us and future generations. Thus what is coming to a head on public land on Burnaby Mountain is the very destruction of the common and public on a planetary scale. But—and I keep coming back to this issue too—can we consider “common” what is also unceded (that is, never deeded or surrendered) indigenous territory? How does a concern for the global biospheric commons intersect with indigenous claims to traditional and long-occupied land? My own answer is—delicately, and not unproblematically. The idea of the commons comes from the European (especially British) tradition of common lands as a system for sustaining local communities: much land was technically private (owned by various aristocrats), but people had local access and use rights to unoccupied (non-agricultural) land, which they depended upon for their survival. These rights were taken away, and common lands “enclosed,” between the 16th and 19th centuries—alongside the development of capitalism. An indigenous sense of land use is not always easy to reconstruct, after 500 years of colonial occupation. Like the idea of the commons, the survival of indigenous communities depended upon access to and use of land—however, no system of property-based ownership seems to have existed. One did not own land: land owned you and your people. As such, you were responsible for the careful stewardship, and even defence, of the land to which you belonged. Unlike capitalism, commons-based and indigenous senses of land use are premised upon the importance of future access and use. Companies like Kinder Morgan operate according to a logic of limitless accumulation of profits: the only sense they have of the future is future profit. Often, fossil fuel companies only need a short-term access to and use of land. 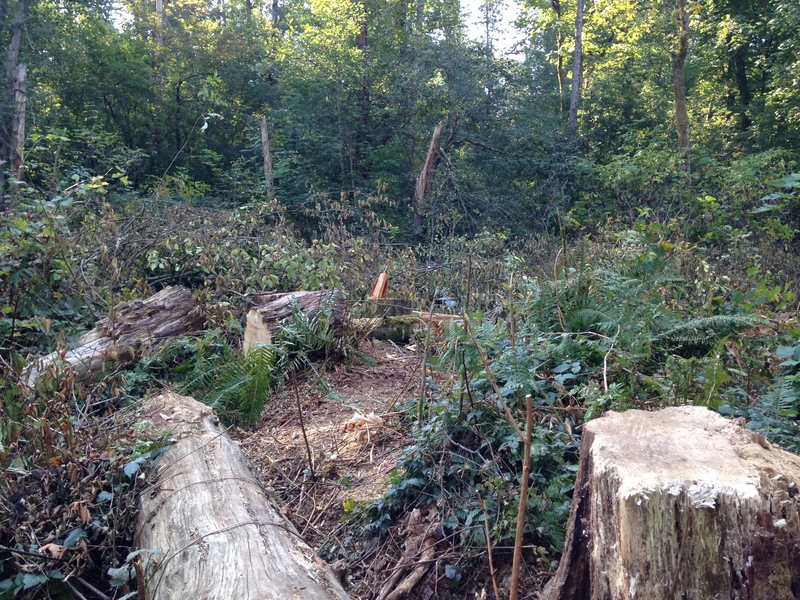 After they are done, the land is often destroyed, irreparably. They move on—seeking something else to destroy in their pursuit of tomorrow’s gains on the stock market, the next-quarter’s returns. So we sit in the forest—we small group of citizen rangers—trying to ward off tree-fallers, drill operators, and helicopters with our bodies occupying trails and clear-cuts. We are, I like to think, commoners too, one and all—keepers of future possibilities, future access and use of this green lung-space we all need to breathe—these waters we all need for provision. And when I say “we” I think of the black bears too, and the Pacific Sideband Snail, and the raven whose call echoes off the mountain slopes. This entry was posted in Uncategorized and tagged aboriginal title, commons, Kinder Morgan on September 29, 2014 by Stephen.